Manila — August 1, 2017 – GE (NYSE: GE) announced today its partnership with the National Grid Corporation of the Philippines (NGCP) for the new 500kV transmission line project and substation located in Hermosa, Bataan. "NGCP supports the government's goal of providing access to electricity to every corner of the country. The Hermosa substation project is in line with the Department of Energy's strategic directions 2017-2040, which is to expand energy access to ensure affordable, reliable, sustainable, and modern energy supply for all," stated NGCP. The project is crucial in accommodating generation capacity additions in the Bataan and Zambales areas. The new Hermosa substation serves as a merging point of power, with an aggregate dependable capacity of about 4,000 MW. The development of a new 500 kV transmission backbone will serve as the additional outgoing circuits from Hermosa to San Jose to allow simultaneous maximum dispatch of existing power plants. NGCP's existing San Jose 500 kV Gas Insulated Switchgear Substation is currently the only connection point from power plants in North Luzon to its delivery points in Metro Manila down to South Luzon. Completion of the project, which is expected in Q4 of 2018, will allow more power transmitted from the source of generation to the point of consumption, and therefore provide more reliable and sustainable power supply to the Luzon grid. GE Power's Grid Solutions business will be supplying 2 banks of 1000MVA composed of 7 x 333.33 MVA, 1-phase, 60 Hz, 500/230-13.8 kV Auto-Transformers; 2 banks of 60MVAr (Bay reactor) composed of 6 x 20Mvar, 6 x 20 MVAR, 1-phase, 60 Hz, 500 kV Power Shunt Reactors; 1 bank of 90MVAr (Line reactor) composed of 3 x 30 MVAR, 1-phase, 60 Hz, 500 kV Power Shunt Reactors. The suite of solutions utilizes the latest in design, measurement and testing tools featuring optimized transformer cooling, low air forced cooler noise, advanced core design techniques that reduce no-load loss and no-load noise, and accurate design verification tools. It also includes a design software to perform advanced transformer analytics to help predict major breakdowns and minimize downtimes. According to Grid Solutions Country Leader Vince Del Mundo, "Connecting people all over the world to the power they need to live and thrive is our purpose. It is fulfilling to know that we play an important part in bringing reliable and sustainable power to the Filipinos, and we are a proud partner to NGCP in its plan to deliver and commission this Hermosa project by year 2018." The Hermosa project is only one of NGCP's grid expansion and reinforcement projects. 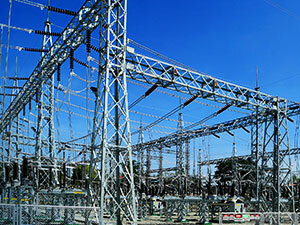 Given its nationwide operations, the grid operator is also continuing its preparatory works to interconnect the Visayas and Mindanao grids, reinforce the Cebu-Negros-Panay link, and complete the Northern Luzon loop, among others, to ensure safe, reliable, and quality power transmission services across the country.